Claude Monet was one of the founders of Impressionism, painted 25 paintings from the Stooges series. Impressionists loved spending time together in the open air. In this picture they are tired and rest in haystacks. "In the middle of the 19th century-a time of change, as Emperor Napoleon III rebuilt Paris and waged war-the Académie des Beaux-Arts dominated French art. The Académie was the preserver of traditional French painting standards of content and style. Historical subjects, religious themes, and portraits were valued; landscape and still life were not. The Académie preferred carefully finished images that looked realistic when examined closely. Paintings in this style were made up of precise brush strokes carefully blended to hide the artist's hand in the work. Colour was restrained and often toned down further by the application of a golden varnish. The Académie had an annual, juried art show, the Salon de Paris, and artists whose work was displayed in the show won prizes, garnered commissions, and enhanced their prestige. In the early 1860s, four young painters-Claude Monet, Pierre-Auguste Renoir, Alfred Sisley, and Frédéric Bazille-met while studying under the academic artist Charles Gleyre. They discovered that they shared an interest in painting landscape and contemporary life rather than historical or mythological scenes. Following a practice that had become increasingly popular by mid-century, they often ventured into the countryside together to paint in the open air, but not for the purpose of making sketches to be developed into carefully finished works in the studio, as was the usual custom. By painting in sunlight directly from nature, and making bold use of the vivid synthetic pigments that had become available since the beginning of the century, they began to develop a lighter and brighter manner of painting. A favourite meeting place for the artists was the Café Guerbois on Avenue de Clichy in Paris, where the discussions were often led by Édouard Manet, whom the younger artists greatly admired. They were soon joined by Camille Pissarro, Paul Cézanne, and Armand Guillaumin. 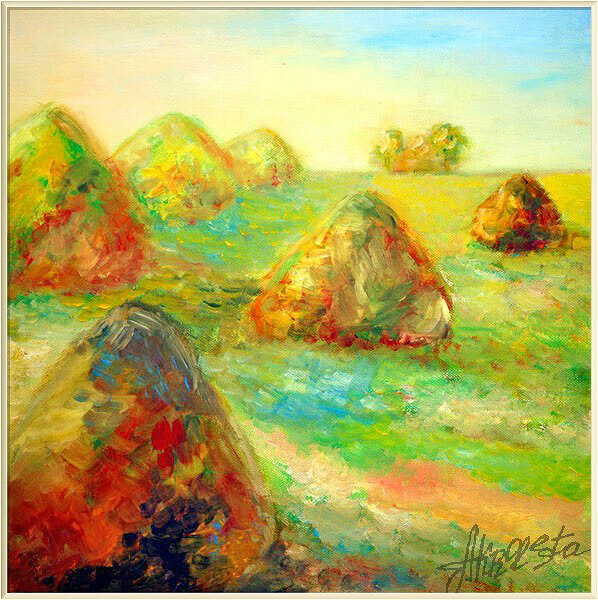 Haystacks is the common English title for a series of impressionist paintings by Claude Monet. The principal subject of each painting in the series is stacks of harvested wheat (or possibly barley or oats: the original French title, Les Meules à Giverny, simply means The Stacks at Giverny). The title refers primarily to a twenty-five canvas series (Wildenstein Index Numbers 1266-1290) which Monet began near the end of the summer of 1890 and continued through the following spring though Monet also produced earlier paintings using this same stack subject. The series is famous for the way in which Monet repeated the same subject to show the differing light and atmosphere at different times of day, across the seasons and in many types of weather. The series is among Monet's most notable work."